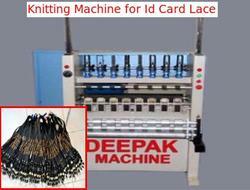 Pioneers in the industry, we offer id card lace knitting machine from India. We are engaged in offering Knitting Machine for Id Card Lace. We are having another range of Knitting machine such as Fast Knit Braiding Machine, Bag Knitting Machine, Elastic Knitting Machine, Fabric Knitting Machine and Circular Knitting Machine.